Wavel en gth-t unable light sources in the near-infrared wavelength band of 1300 to 1550 tun are finding increasing use in fiberoptic instrumentation. Applications include characterization of gain in optical amplifiers as a function oi wavelength and optical dispersion measurements in fiber systems. One method of making a widely tunable, narrow-line width optical source is to use an externa I-cavity laser (Pig. 1). This laser is wavelength-tuned by mechanically rotating a diffraction grating- A wavelength-selective side-mode filter ensures single-mode operation. As indicated hi Fig. 1. ;ui integral part of the external cavity laser is the laser module, which is described in this article. The design of the externa I-cavity tunable laser source as well as several instrument applications are covered in more detail in the articles on pages 11 and 20. The laser module must maintain precise alignment between the laser diode and two collimating lenses and provide electrical connections for the laser chip drive current and the laser temperature controller. We have provided this functionality in a small, robust and hermetic package (Fig. 2). A schematic diagram of the laser module is shown in Fig. 3, A semiconductor laser chip with one facet antirefleetion-coated is solder-mounted to a submount and heat sink. The heat sink is temperature-controlled with a Peltier cooler using a thermistor to monitor the temperature. The reduced temperature extends the laser life and increases the optical output power for a given laser current. In addition, by minimizing temperature fluctuations, thermally induced refractive index changes in the chip are reduced. This improves the wavelength stability of the external-cavity laser. Semiconductor lasers operating in a humid environment can have compromised reliability. This is particularly true when the laser is at a reduced temperature, which encourages water condensation on the laser surfaces. To avoid this problem in the module, hermetic solder seals are used throughout. The optical signal for the external-cavity laser is produced in a semiconductor laser diode chip. The laser diode is a quaternary InGaAsP index-guided buned-heterostructure device produced on an InP substrate. The center wavelength of the laser is determined by the quaternary material composition and can be varied to produce lasers with center wavelengths near the two wavelength bands of interest in telecommunications. 1300 run and 1550 nra. The endfaces of the device tire cleaved to produce semiconductor mirrors. Ohmic contacts on the top and bottom of the device are used to inject current, which produces optical gain and light output. Anti-reflection coating on the cavity-side facet of' the laser diode reduces the feedback from this facet. This feedback must be minimized to give a broadband tuning range ( > 100 nm). Reflections would introduce ripple in the power output spectrum of the external cavity source its described in the article on page 35. Small amounts of output power ripple can be compensated by varying the laser drive current in the instrument to achieve constant power, However, for maximum output power stability in the source while sweeping in wavelength, it is desirable to minimize the facet reflectivity as much as possible. Fig. 1. .Schematic diagram of a wavelength-tunable external cavity laser containing a hermetic laser module. below the lasing threshold (Fig. 4). Knowing the uncoated facet reflectance and then measuring the ripple in the same chip after coating, it is possible to calculate the coating reflectance as a function of wavelength (Fig. 5). 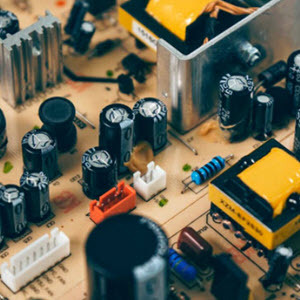 This result is for a three-layer coating of hard dielectric materials that are impervious to changes in humidity, This stable multilayer coating has a much wider range of wavelengths with low reflectance than can be produced with an ideal single-layer coating. The ant ¿reflection coating must be optimized separately for both 1300 nra and 1550 rati lasers. Fig. 4. Spectral ripple of an (a) uncoated and (b) antireileclion-roaterl semiconductor laser measured below threshold. the lowest possible threshold. Extremely precise laser-to-lens alignments are required for optimum instrument operation. 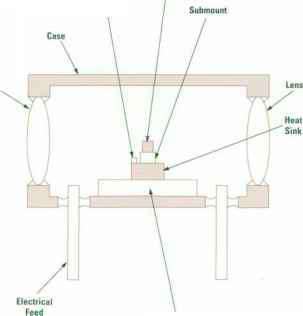 Laser-to-lens misalignments of less than a few micrometers are required of both lenses before assembling the module into an instrument Misalignment of the lens arid the laser caases output beam defocusing or tilting. After the alignment is verified the package is checked for leaks using helium, backfilled with diy nilrogen, and solder sealed. A cable and an electrostatic discharge (BSD) protection plug are attached. Proper ESI ) procedures are observed through-oul the process since ESD damage can cause latent laser failures, w hich degrade I he long-term reliability of the module. Once the module is assembled and aligned in an instrument, the long-term alignment tolerances are even more severe—on the order of a few tenths of a micrometer. The Peltier cooler in the module and the heated and enclosed environment of the instrument help guard against I hernial expansion of the package, which could produce misalignments and output poweir variations over the operating temperature range of the instrument.